Windows 7, Windows 8, Windows 10, and Windows Vista have a built-in firewall, which is enabled by default. When it's enabled, it generally blocks any software on your computer from being reachable from the Internet. Since EchoLink relies on being reachable from the Internet, it will also prevent EchoLink from working, unless a special "exception" is added for EchoLink. 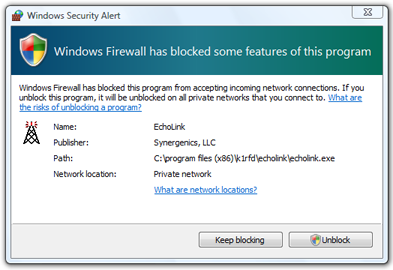 You can automatically set up Windows Firewall to work with EchoLink by simply choosing "Unblock". This will create a special exception in the Windows Firewall settings that allows EchoLink to be reached from the Internet. Windows remembers this setting, so you will not need to "unblock" EchoLink each time it runs. If this message does not appear when you start up EchoLink, but you are having trouble getting EchoLink to connect to other stations (or the Test Server), try following the instructions below. 2. In the control panel, under Security, click the link called "Allow a program through Windows Firewall". 3. In the General Tab, be sure that the option "On (recommended)" is selected. If not, click it. 4. Be sure the checkbox "Don't allow exceptions" is not checked. 5. Click the Exceptions tab at the top. 6. If EchoLink isn't already in the list of programs, click Add Program... (near the bottom). A list of programs on your computer is displayed. Locate EchoLink in the list of programs. Highlight it and click OK.
7. Be sure EchoLink is checked, then click OK again to complete the Windows Firewall setup. Q: Why does EchoLink need an "exception"? A: Unlike most of the other programs you probably run on your computer, EchoLink is a peer-to-peer system. This means that the EchoLink software must be able to receive information directly from other computers on the Internet, as well as send it. By creating a firewall exception, you are instructing Windows to allow your EchoLink node to accept voice and text messages from other EchoLink nodes. Q: Am I putting my computer at risk by creating a special exception for EchoLink? A: With this configuration, when EchoLink is running, Windows Firewall will allow other EchoLink nodes to communicate with your computer using two UDP ports (5198 and 5199). 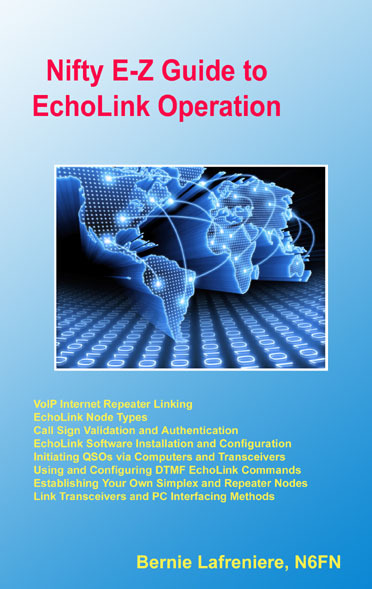 These are the only incoming ports that the EchoLink software requires. Because of the way the EchoLink software is designed, these ports cannot be used to transfer viruses or other harmful data to your computer. In addition, Windows Firewall ensures that these ports are not "open" except when the EchoLink software is running. 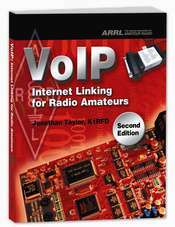 Q: I already have a router or firewall (separate from my computer). Why do I need the Windows Firewall at all? A: If you already have a "hardware" firewall on your home network, you might choose to turn the Windows Firewall off entirely. For more information, see the Microsoft Web site. Q: I've added the exception for EchoLink, but I still can't connect to the Test server, or to any other stations. What's the problem? A: Most likely, another software or hardware firewall is blocking the connection. For more information, try running the Firewall/Router Test (from the Tools menu of the EchoLink software), and read the report it generates. Also, take a look at the Firewall Solutions page for hints.